By Grimshaw, Baxter & James Jones Elliott Ltd. of London (G.B.E.). The clock has a 14" white painted dial within a solid mahogany 18" diameter case. 8-day single fusee G.B.E pendulum movement. The dial is in very nice original condition with Roman numerals, manufacturer's name, war department broad arrow and markings 'D.213'. It is totally unrestored and displays some craze marking and staining but virtually no paint loss or chipping, even at the edges or where the three dial posts are attached. 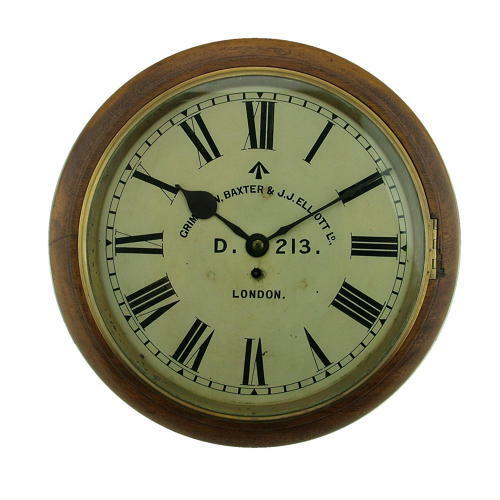 All markings are very clear, the hands are original to the clock and remain in good order. The dial screws have been replaced as is usually the case. The mahogany surround has a lovely patina and is free from damage beyond normal minor scratches/nocks and a small 'chip' adjacent to the hinge - see photograph. The back box is also very good, clearly stamped 'RFC' and has a later King's crown Air Ministry mark. In addition it has the original maker's label glued to the back advising that 'Great care must be observed in handling this clock especially after the clamping screw has been removed from the pendulum. It must always be kept either in a vertical position or resting on its face'. Both the lower and side access doors are present and complete with closure catches. The box also retains its hanging plate and both lower corner positioning plates to allow the clock to be screwed to the wall once in the correct position. The original cast brass bezel is excellent and still has the original hinge. The glass is original and generally very good bar a smallish crack at the edge. The movement is simply signed 'G.B. & E. Ltd. London' and comes with its original pendulum. It appears quite clean, has been lubricated, and is running strongly. This clock is a rare survivor of the earliest type of RAF white dial clock made by Grimshaw, Baxter & James Jones Elliott Ltd. of London for the Army prior to the First World War. This was then issued to the Royal Flying Corps, later passing to the RAF when formed in April 1918. G.B.E. Ltd. was disolved in 1921 leading to the formation of F.W. Elliott Ltd. who were responsible for the production of many of the RAF clocks found today. All in all this is a stunning unmolested clock from the very beginning of the RFC and RAF and is much rarer than an Operations room 'Sector' clock. Stock code C22095.